A Climate Realist’s not so short Answers to Hard Questions About Climate Change. Question 2 (of 16) How much trouble are we in? – Len Bilén's blog, a blog about faith, politics and the environment. A Climate Realist’s not so short Answers to Hard Questions About Climate Change. Question 2 (of 16) How much trouble are we in? Justin Gillis answer to Question 2. How much trouble are we in? “For future generations, big trouble. The risks are much greater over the long run than over the next few decades, but the emissions that create those risks are happening now. Over the coming 25 or 30 years, scientists say, the climate is likely to resemble that of today, although gradually getting warmer. Rainfall will be heavier in many parts of the world, but the periods between rains will most likely grow hotter and therefore drier. The number of hurricanes and typhoons may actually fall, but the ones that do occur will draw energy from a hotter ocean surface, and therefore may be more intense, on average, than those of the past. Coastal flooding will grow more frequent and damaging. Longer term, if emissions continue to rise unchecked, the risks are profound. Scientists fear climate effects so severe that they might destabilize governments, produce waves of refugees, precipitate the sixth mass extinction of plants and animals in Earth’s history, and melt the polar ice caps, causing the seas to rise high enough to flood most of the world’s coastal cities. My answer to question: 2. How much trouble are we in? For climate alarmists: big trouble, for climate realists, not anything out of the ordinary as to temperature rise. The temperature rise is predicted using models that assume the major effect on the climate is from rising CO2 and ignore other factors such as a changing cloud cover. The imbalance due to rising CO2 levels is less than 2W/m2, and every percent change in cloud cover makes a larger difference. 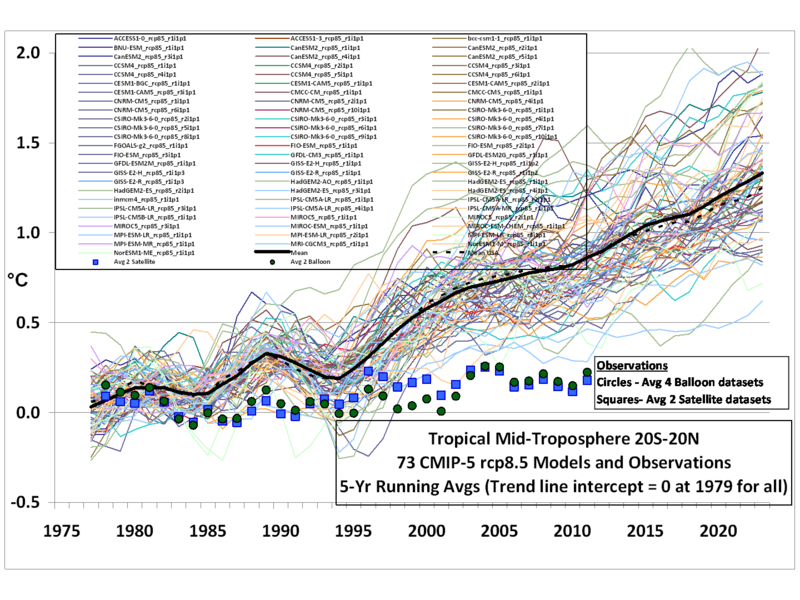 Here is the performance of 73 climate models versus observations. There is almost no correlation between models and observations. What is the problem? Looking at how the models model clouds gives a hint: The models are way off on the amount of clouds. Antarctica is almost cloud free and the Arctic has plenty of clouds. This means the models totally underestimate the effects of water vapor (the source of clouds) and overestimate the effects of rising CO2. It turns out that clouds are the major stabilizer of the climate on the high end, thanks to their high negative feedback – more clouds, cooler climate. This means that even with a doubling of the CO2 levels we will not even get back to even the Medieval warm period. We are in a long cooling trend. No such feedback occurs when it cools, rather more snow means higher albedo which leads to a new ice age. More CO2 will delay the onset of the next ice age, but will not prevent it. Fear not, the next ice age is probably more than 5000 years away. Previous Previous post: A Climate Realist’s not so short Answers to Hard Questions About Climate Change. Question 1 (of 16) How much is the planet heating up? Next Next post: A Climate Realist’s (not so) short Answers to Hard Questions About Climate Change. Question 3 (of 16) Is there anything I can do?